The Xplorer Halfpack is a high quality backpack that can also be carried as a messenger bag or a briefcase. It’s spacious enough to be used by college students hauling books and electronic devices around, and stylishly casual enough to use for a daily commute to the office. 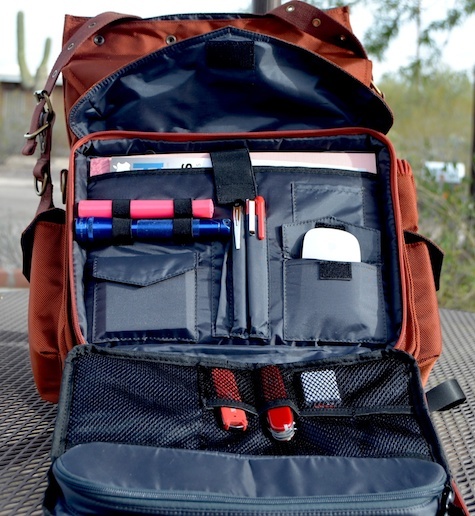 I used it on two weekend trips and found it perfect for carrying a change of clothes, an iPad, an iPod, iPhone, toiletries, medicines, and magazines. With its leather straps, which allow you to expand or contract the storage space, the design suggests an old-fashioned book bag, the kind of thing you might see in British movies set in the early 19th century. I asked ten different people, ages 11 to 48, for their impressions of this bag and the comments ranged from “ugly but functional” to “very cool” but over-priced. Everybody I asked had a different opinion. The only consensus was that the bag is sturdy and very well made. When it comes to style, I confess to being a bit of a Luddite. If the bag is made with good material, in this case a taut, high quality nylon, and seems functionally well thought out, as this is, I’m content. One member of my focus group described the pack as “more masculine than feminine.” Another said it looked “too rugged” to fit into a corporate atmosphere. But if you work in a casual environment, you’ll fit in nicely. The main compartment can be accessed either from the top, which closes with snaps, or from a zippered front entrance, lower down. There are six external pockets: two that close with zippers and four with Velcro flaps. The largest of these external pockets can easily accommodate all your office paraphernalia, thumb drives, memory cards, iPod, letter-sized file folders, pens, a pad of paper, keys, and so forth. There’s a separate zippered compartment in this section that’s perfect for cables or earphones. One of the external side pockets has an elastic band in it that will hold a small bottle of water snugly. A separate zippered compartment on the back is suitable for an iPad. One thing that impressed me about this padded rear compartment is that it will accommodate an iPad even if it’s encased in a beefy case like my Otter Box. Other packs I’ve seen will only hold an iPad if it’s naked. With the main storage compartment fully extended to its full height, you can also carry a 15-inch laptop, though it’s an awkward fit. A 13-inch laptop is the target computer for the dedicated space. The Xplorer Halfpack comes with two straps. 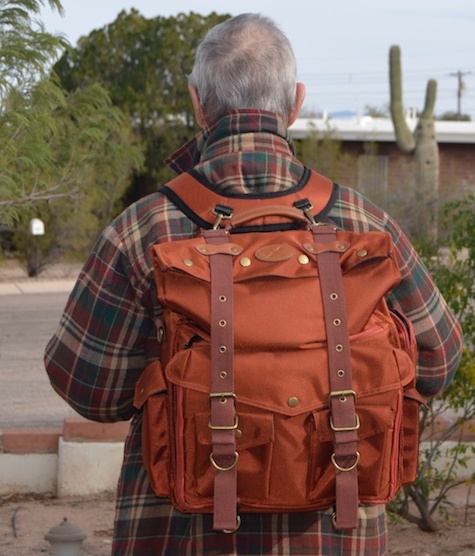 The backpack shoulder straps are comfortable but not heavily padded. You can easily unbuckle them from the pack and put on the single messenger bag strap that slips over your head and drapes across your chest. There’s no padding to speak of on that one, either. Urban Explorer hints that padding may be beefed up in future versions. 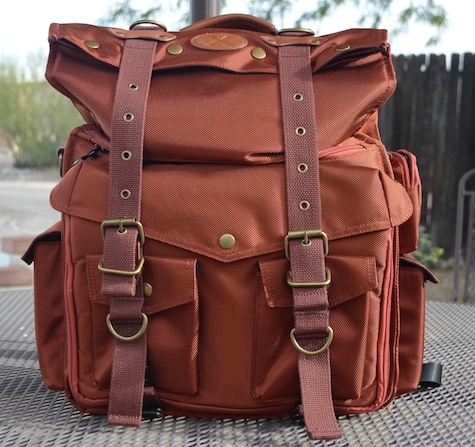 The pack is available in three colors: burnt orange, black and “Brooklyn bronze.” It weighs 4.5 pounds when empty. While not suitable for trail hiking, the Xplorer Halfpack is perfect for a daily commute to the office or a weekend get-away.